Flanders' environment minister has resigned after causing an outcry when she suggested that a series of student-led climate marches in Belgium were a "conspiracy". 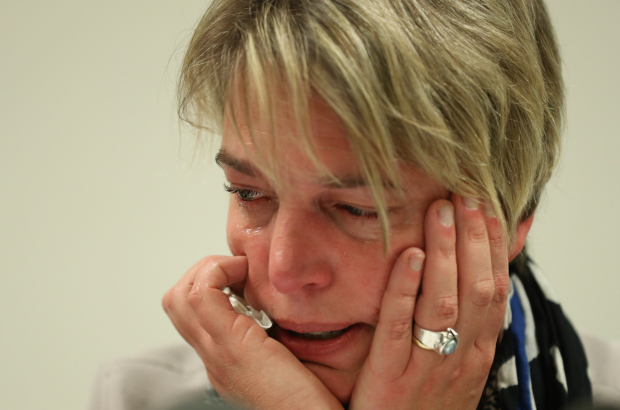 "The controversy has become too big," a tearful Joke Schauvliege told reporters on Tuesday. "Faced with a torrent of criticism, it was no longer possible [to carry on]." Schauvliege apologised for her earlier comments, in which she questioned how spontaneous the youth mobilisation for the climate had been. She claimed that the marches were "more than just spontaneous actions of solidarity" - and she "knew who was really behind this movement". Anuna De Wever, the 18-year-old student who co-initiated the Youth for Climate movement, said: "At first I laughed very hard. If she thinks it was a plot, it means our actions are having an impact." She said the claim that there was a plot behind the movement was an insult to the thousands of young people who have skipped school every Thursday to join the marches in Brussels and other Belgian cities. For a fourth consecutive week, 12,500 students marched in Brussels last Thursday. Another 15,000 gathered in Liège and 3,500 in Leuven. The pupils plan to march, at least in Brussels, every Thursday until the elections – regional, federal and European – in May. Flemish minister-president Geert Bourgeois said of Schauvliege's resignation: "I understand the decision she has taken. Her position had become untenable." There is no news yet of her successor. Anything spontaneous that aims for the good of all must be suspicious as Belgian politics go. Who knows what it will take to get genuine action from Belgian politicians. No civic sense is required to get into office.